Salvia elegans ‘Frieda Dixon.’ Annual. Sun to Partial Sun. Height 18” – 24”. A deciduous, aromatic plant with green leaves and brilliant pink flowers that bloom in the Spring and Fall. 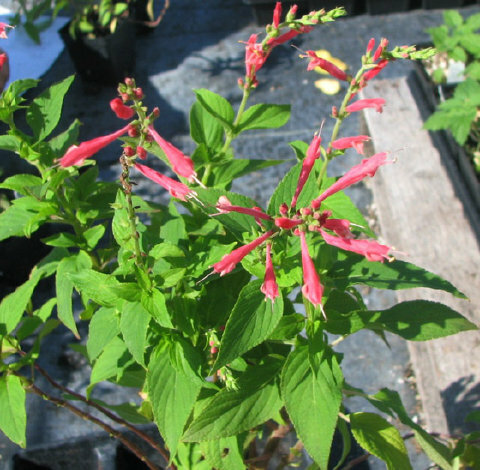 Pink Pineapple Sage is an equally easy garden plant to grow as well as being a great addition to any garden or landscape for summer color and summer fragrance. It prefers moist moist soil and grows rapidly. It blooms in the Fall with beautiful bright prink tubular flowers that hummingbirds and butterflies cannot resist. Bruising a leaf or two of the Pineapple Sage when walking through the garden emits an intense fresh pineapple scent. The fresh leaves of pineapple sage are used in fruit salads and drinks. Crush a few fragrant leaves iced tea for a flavorful treat. Chefs enjoy using the flowers in sorbets. The delicious flowers add color and flavor to salads and deserts.